Latest IDC market numbers show momentum continues for both public and private cloud equipment. Need more proof that cloud computing is taking over? Just before the Independence Day holiday, research firm IDC released its assessment of the Worldwide Cloud IT Infrastructure Market—and the numbers were astonishing. According to the firm's Worldwide Quarterly Cloud IT Infrastructure Tracker, server, storage, and Ethernet switch revenue for public and private cloud systems grew by 25.1% year over year to nearly $6.3 billion in the first quarter of 2015. Even more importantly, perhaps, the percentage of total IT infrastructure spending devoted to the cloud continues to mushroom to nearly 30%, up from 26.4% a year ago. Private cloud revenue jumped 24.4% to $2.4 billion, while the public cloud grew even faster—25.5%— to $3.9 billion. Servers led the way, up 28% for the private cloud and 33% for the public cloud. Compare that to the slower growth of non-cloud IT infrastructure, which increased by 6.1%, primarily due to server sales (non-cloud Ethernet switch sales ticked up just 1%, while storage sales actually declined). "Cloud IT infrastructure growth continues to outpace the growth of the overall IT infrastructure market, driven by the transition of workloads onto cloud-based platforms. 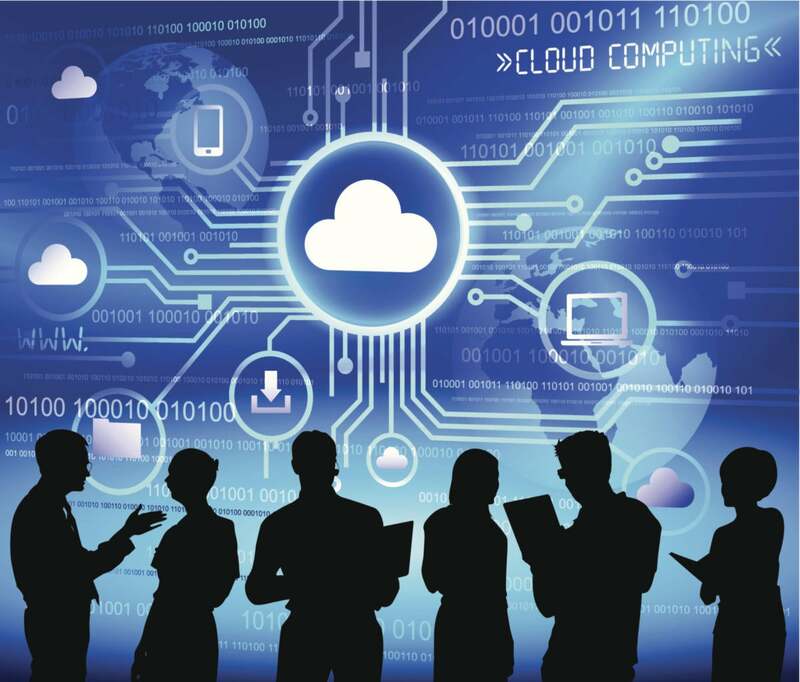 Both private and public cloud infrastructures have been growing at a similar pace, suggesting that customers are open to a broad array of hybrid deployment scenarios as they modernize their IT for the 3rd Platform, begin to deploy next-gen software solutions, and embrace modern management processes that enable agile, flexible, and extensible cloud platforms." 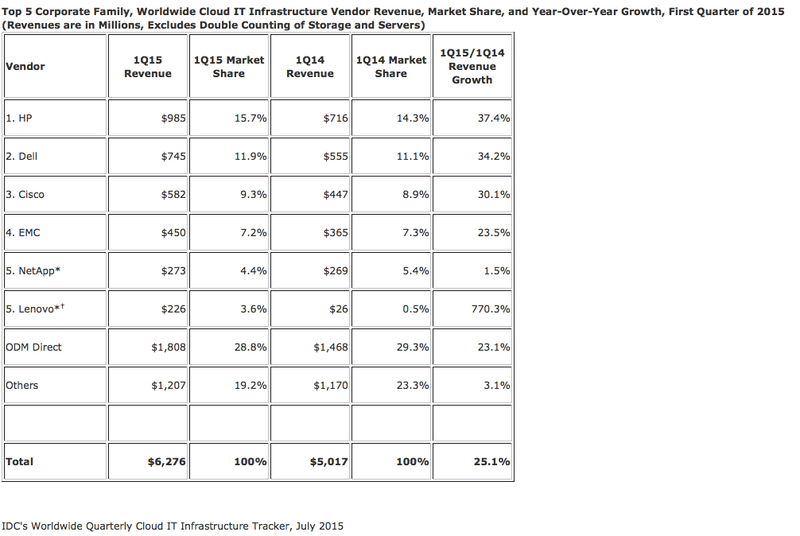 Put simply, the cloud is winning, and it's happening all over the world. The only place cloud IT infrastructure sales declined was in Central and Eastern Europe, where political and economic upheaval has affected overall IT spending—along with just about everything else, of course. Amazingly, IDC said the quarter showed only the second highest total and growth rates since the company has been tracking these figures, which proves that no matter how you measure it, cloud growth has been on a tear for a while now. IDC says HP, Dell, Cisco, EMC, NetApp, and Lenovo lead the cloud infrastructure market, and all except NetApp enjoyed solid growth, with the biggest percentage gains going to the companies at the top of the heap. And don't get too excited about Lenovo's 770% revenue growth. That's largely due to purchasing IBM's x86 business last October.